We meet in Zermatt, board a tram/gondola to Schwarzsee Ski, descend to the Zmutt-gletscher. Skin up to the Schönbielhütte, 2694 m.
Climb up to the Arbenhorns, 3860m. Ski descent to the Col Durand the high Plateau des Glacier Durand. Descend to the Glacier du Mountet. Short climb up to the Cabane du Grand Mountet, 2886m. Climb to the Blanc de Moming, 3657m. Ski descent to the Glacier de Moming. Traverse to the Cabane d’Ar Pitetta, 2786 m, short climb to Col de Milon, 2990m. Descend to the high pass, 2794m and climb to the Cabane de Tracuit, 3256m. Climb to the Bishorn 4153m. Ski descent and climb to the Adlerflüh, 2940m, descend over the Brunegggletscher, short climb to the Turtmannhütte, 2519m. Climb to the Schöllijoch, 3343m. Ski descent on the Schölligletscher to the Topalihütte, 2674m. 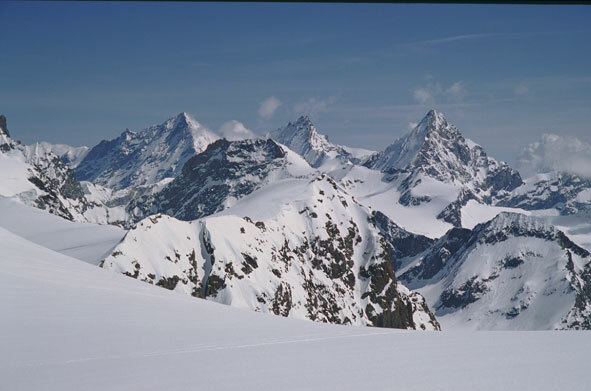 Encircle the Oberen Stelligletscher, and climb to the Col, 3228m from the Wasuhorns. Short peak ascent to the Wasuhorn, 3343 m. Ski descent to the Jungtaljoch, 3220m. On to the Jungtal we continue to the top tram/gondola station of Alp Jungen, 1955m, to St.Niklaus. May, 2019 On request I will work out your preferred date of the tour! Includes: hut fees, 5 breakfasts and 5 dinners, 1 liter of tea, 6 days guiding. Not included: Travel expenses to and from the meeting place, travel expenses like tram/train/taxi cost during the tour, lunches, drinks, dinners in towns, rental equipment and souvenirs. The tour de Ciel is in very demanding in high Alpine terrain and requires excellent experience in ski touring, Skiing technique and physical conditions. Carrying only the lightest pack, you cross massive glaciers surrounded by spectacular mountains, eat homemade food and sleep in a real bed in one of the many huts along the route. Maximum comfort in the huts, maximum safety, maximum view, minimum packs: the recipe for an unforgettable experience in the Swiss Alps. This is a strenuous tour and requires a high level of physical fitness. A normal day will be 8-10 hrs. of uphill and downhill skiing in high altitude with a light backpack. Participants must be strong skiers, PSIA level 9, able to perform strong dynamic parallel turns with ski randonne equipment while carrying a pack in all snow conditions: powder, hard packed and crud snow. Advanced steep uphill skiing techniques, experience with ski crampons as well as excellent Euro-uphill kick turns in all conditions are required. Basic mountaineering skills are helpful; we may use a rope, ice axe and crampons. Bring only gear you are used to (brand new, unknown gear not ideal), broken-in ski randonne boots, and the correct full skins. Reading for route description and guide book: Alpine Ski Mountaineering: Volume 1 Western Alps by Cicerone Guide.